We get it—you’ve got big publishing dreams. But in order to get your own book on the shelves, it’s often vital to have some publishing experience behind you—not least because it'll help you get noticed by agents and publishing houses alike. A great way to do this is by entering your work into short story contests. Not only are you gaining amazing publishing credits in some of the country’s most lucrative journals and magazines, but unlike simply submitting your work, you can also win a nice stack of cash. Just for you, we’ve rounded up seven of the best upcoming short story contests that are open for submission right now. That’s right: we’ve just made submitting a total breeze. An annual fixture in the Canadian lit contest circuit, the CBC Short Story Prize is known for providing great exposure to emerging writers. Past winners include D. W. Wilson, Bill Gaston, and Gwendolyn MacEwen. Criteria: All entries must be original and unpublished pieces of short fiction, and they must not exceed 2,500 words. Open to Canadian citizens and permanent residents of Canada. Prizes: The winner receives $6,000 from the Canada Council for the Arts, their story will be published on CBC Books, and they’ll have the opportunity to attend a two-week residency at the Banff Centre for Arts and Creativity. Four finalists will receive $1,000 and also have their story published on CBC Books. Take a gander at their contest details! Based out of Victoria, British Columbia (the OG home of JEC), The Malahat Review has been an integral Canadian publication since its conception in 1967. Dedicated to excellence in both Canadian and international writing, The Malahat Review is recognized for featuring poetry, fiction, and creative non-fiction. 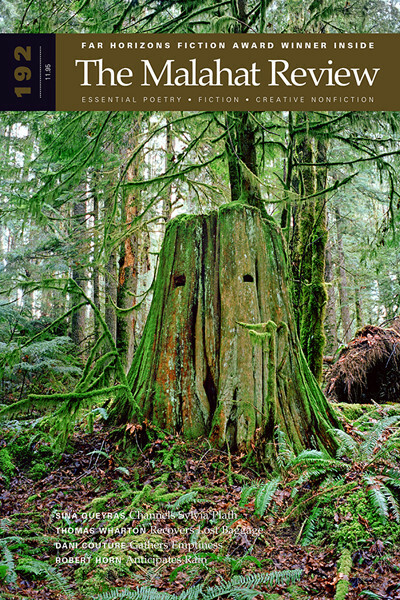 Criteria: The Malahat Review is seeking entries in poetry, fiction, and creative non-fiction. All entries must be previously unpublished, and they must not exceed 2,500 words for both fiction and non-fiction, and 100 lines for an individual poem (you can submit up to three poems). Multiple entries are allowed. This contest is open to all Canadian and international writers. Check out their contest guidelines for more information. Recognized for its focus on female and genderqueer writers and artists, Room publishes short fiction, poetry, creative non-fiction, and art out of Vancouver. Notable contributors include Lorna Crozier, Bronwen Wallace, and Ursula K. Le Guin. Criteria: Room is looking for a wide variety of entries in their Short Forms Contest. Each entry can either consist of one or two prose poems, flash fictions, or flash creative non-fiction works, so long as each work does not exceed 500 words. All genres will be judged in a single category, regardless of genre. This contest is open to Canada and the United States only. Prizes: First prize is $500 and publication in Room. For more information on details and upcoming contests, check out their contest calendar. Need a helping hand this contest season? Worry not! We offer some amazing prize-winning editing packages—like the one below—to help you boost your chances of winning. Based out of Winnipeg, Manitoba, Prairie Fire is one of Canada’s oldest literary magazines, founded in the late 1970s. A quarterly publication, Prairie Fire is known for the way it serves its regional, national, and international audiences by publishing a wide range of genres and voices. Notable contributors include George Bowering, Daphne Marlatt, and Sylvia Legris. Criteria: The 2018 Annual Writing Contest is open to poetry, fiction, and creative non-fiction. Each entry must be an original, unpublished piece. Fiction entries must not exceed 10,000 words, while creative non-fiction must not exceed 5,000 words. Up to three poems may be entered at a time, each with a limit of 150 lines. This contest is open to Canadian citizens and permanent residents of Canada. Prizes: Prizes will be awarded in each category, with winning entries published in Prairie Fire. First prize is $1,250, second prize is $500, and third prize is $250. For more information, check out their contest guidelines. Based out of the University of New Brunswick, The Fiddlehead was established in 1945 and is recognized as one of Canada’s most prestigious literary magazines. Publishing everything from poetry and fiction to reviews and interviews, the magazine is known for including a wide variety of content throughout its quarterly publications. The literary magazine has known connections to writers such as Al Purdy, Don McKay, and Jan Zwicky. Criteria: The Fiddlehead is currently seeking poetry and short fiction submissions for their 28th Annual Literary Contest. All submissions must be original and unpublished. Short story submissions must not exceed 6,000 words, while poetry submissions must not exceed 100 lines per poem. Multiple submissions are accepted. This contest is open internationally. Prizes: Winners of either category will receive $2,000, while runner-ups will take home $250. The winning entries and honorable mentions will also be published in The Fiddlehead’s Spring 2019 issue. Check out their contest details for more information! Established in Vancouver in 1990, Geist is recognized as a central publication in the Western Canadian literary scene. Known for its appreciation for the grittier, bizarre sides of literature, Geist prides itself on its “intelligent, plain-talking, inclusive, and off-beat” tone, publishing notable writers like Evelyn Lau and Miriam Toews. Criteria: Each year, Geist announces their Literal Literary Postcard Story Contest, for which entrants are asked to mail Geist a postcard and a short story with a maximum length of 500 words (very short indeed!). There must be a connection between the story and the postcard; the extent of that connection is entirely up to you! This contest is open internationally. Prizes: $500 for first place, $250 for second place, and $150 for third place. All winning stories will be published in Geist and on geist.com. For more information about contest details and updates on deadlines, check out their contest page. Held by PRISM International, a quarterly magazine out of Vancouver, this contest is in honour of Jacob Zilber, a writer and respected teacher who helped to form UBC’s Department of Creative Writing alongside Earle Birney. PRISM was established in 1959 through the UBC Department of Writing and has since published the works of Margaret Atwood, Michael Ondaatje, and Gabriel Garcia Marquez. Criteria: Short fiction entries must not exceed 6,000 words. All work must be original and unpublished. This contest is open internationally. Prizes: The winning entry will be awarded $1,500, with $600 awarded to the runner-up, and $400 to the second runner-up. For more information, read their contest guidelines. We hope this information inspires you to get your work out there. Good luck, and happy writing! You want to get published, and we can help. Yes, really! Sign up for our Publishing Guidebook for more information on how JEC can help you make all your publishing dreams a reality.